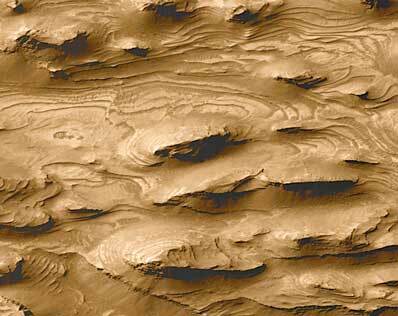 In what ultimately may be their most significant discovery yet, Mars scientists say high-resolution pictures showing layers of sedimentary rock paint a portrait of an ancient Mars that long ago may have featured numerous lakes and shallow seas. 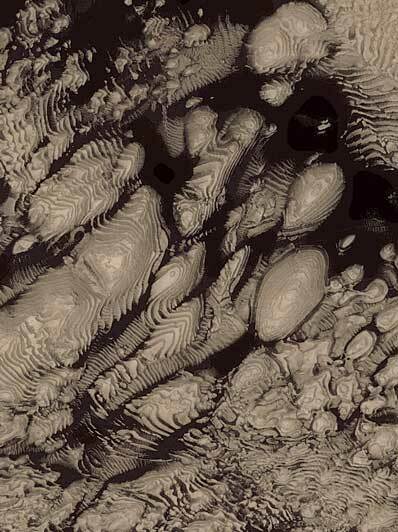 This high resolution picture was the first image received by Mars Global Surveyor scientists that began to hint at a larger story of layered sedimentary rock on the Red Planet. Photo: NASA/JPL/MSSS. Hundreds of layers of similar thickness, texture, and pattern have been exposed by erosion in a 64 kilometer-wide (40 mile-wide) impact crater in western Arabia Terra. MGS provides a high resolution view of layer outcrops that were previously not known to exist in this crater. Photo: NASA/JPL/MSSS. Dots on this map of Mars indicate all of the places identified from more than 65,000 Mars Global Surveyor images acquired through October 2000 as having sedimentary rock outcrops. Most of them occur in six specific regions that are within 25 degrees of latitude of the martian equator -- Valles Marineris, Mawrth Vallis, Western Arabia Terra, Terra Meridiani, northern Hellas, and part of the Aeolis region south of Elysium Planitia. Photo: NASA/JPL/MSSS.